Video displays use one of two scanning methods to draw the picture on the TV screen: interlaced and progressive. All HDTVs are progressive-scan displays — so even if the signal being sent to the HDTV is interlaced, the HDTV will convert it to progressive scan for display on the screen. 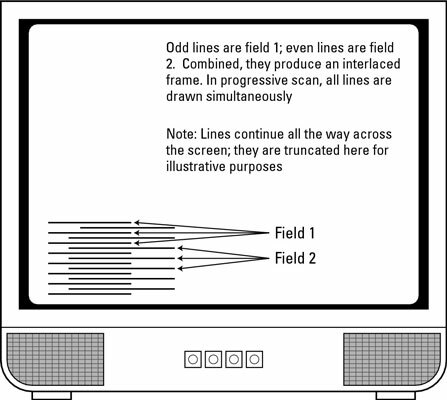 Interlaced scan: Traditional TV systems (such as NTSC, the standard TV system in the United States) use an interlaced scan, where half the picture appears on the screen at a time. The other half of the picture follows an instant later (1/60th of a second, to be precise). The interlaced system relies on the fact that your eyes can’t detect this procedure in action — at least not explicitly. Progressive scan: In a progressive-scan system, the entire picture is painted at once, which greatly reduces the flickering that people notice when watching TV. Progressive scan is available throughout a range of TV types.